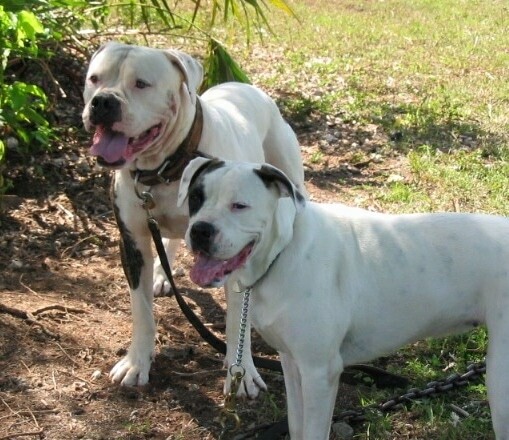 American Bulldog Dog Breed Pictures, 9 . 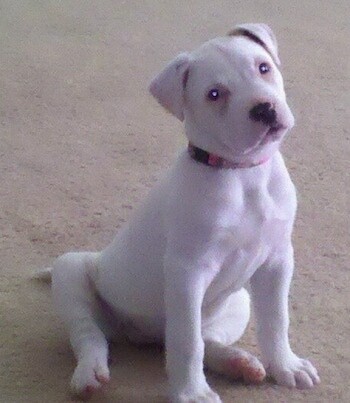 Shadow the American Bulldog as a puppy at 10 weeks old—"This is Shadow, my American Bulldog pup. He has the greatest personality, a bit of a clown and as strong as an ox. He weighs 27.3 pounds already. Training him has been a breeze, he is so smart. He learns a command after a few times. 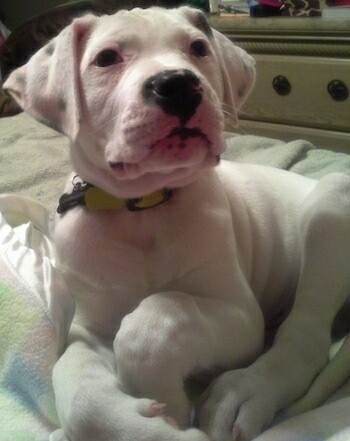 He is the best puppy and I look forward to raising this Beautiful American Bulldog!" 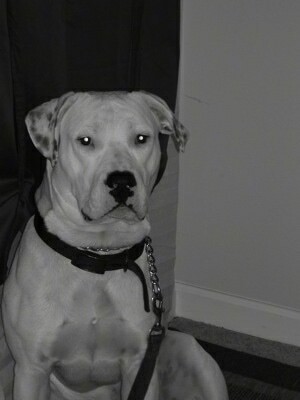 Jynx the XL American Bulldog at 5 years old—"My big boy. He's a gentle giant. 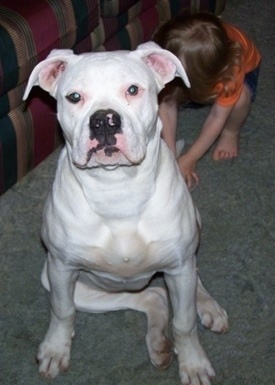 Jynx shown here at 5 years old and 125 pounds (56 kg)"
Tut the American Bulldog puppy at 8 weeks old—"This is Tut. I got him at 5 weeks of age. I never wanted a male dog, but now I won't trade him for anything! At 10 weeks old he weighed 22 pounds." "This is Asia at approximately 9 1/2 weeks, looking quite inquisitive! She wasn't sure what to think about the noise the camera was making! She's a very smart girl, but awfully stubborn! We have started obedience training with her and although commands take a while to imprint, once she has it, she's golden! She now sits in her "spot" in the kitchen and waits quietly and patiently while we fill her food and water bowl. When her bowls are full she continues to wait patiently, all eyes on us, until we tell her "Good girl, you can have it!" She's so full of life and we just LOVE her!" 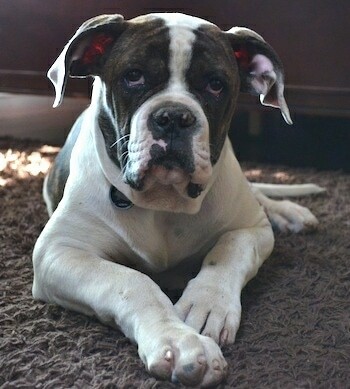 "This is Cooper, our American Bulldog puppy at 4 months old. He has been a tremendous addition to our family!! We are a family of five and never before had a dog. 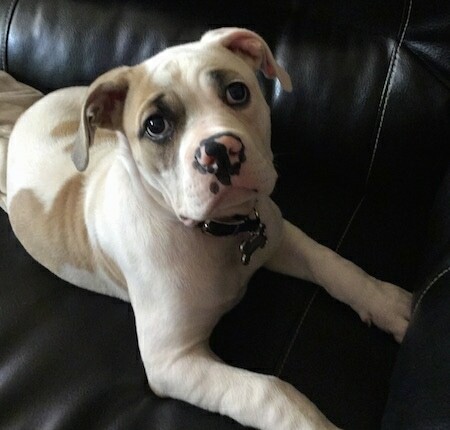 We decided on an American Bulldog because of what we have read before about their temperament: protective, loving, and a good indoor/outdoor dog, but we never knew he would be such a joy!!! He loves to fetch, play tug and when it is time to mellow out, he does!!! He simply picks a spot in the room and relaxes while we go about with our business!! We couldn't be happier with Cooper and can't wait for everything that is to come!!!" "This is a photo I took while we were playing in the yard one day. 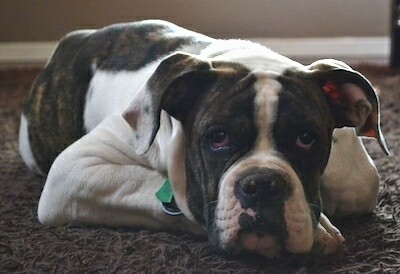 Maggie is a three-year-old American Bulldog. Her mom is a Johnson type and her dad is a Scott type. We did not know anything about this breed before we got her but we quickly realized that we had to learn fast. She is very strong-willed and also just plain strong! We used private training as well as Cesar Millan’s advice of exercise first, then discipline, then love. This breed needs hours of exercise a day and a strong pack leader. By fulfilling her needs, we have been able to see her develop to her full potential. 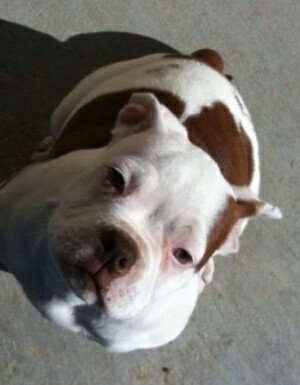 American Bulldogs are not for everyone so please choose this breed only after very careful thought." "She is calm and content in the house and understands that outside is where she can run wild and play rough. She is loving, fearless and protective. She is also exceptionally smart. She knows her toys by name and could play hide-and-seek for hours. When we tell her to go to her bed she does and does not get up until given permission (so we can eat dinner without her begging for bits). She truly listens to her people and is eager to please. 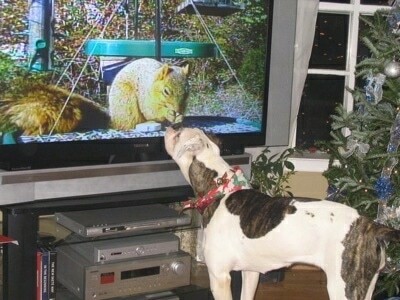 She does not like looking at herself in the mirror and she growls at animals on TV and in movies. She loves children and people and wants to be everyone’s best friend. We will never own a different breed. She has our hearts forever." 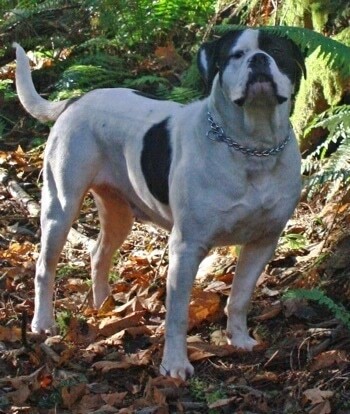 "These pictures of our American Bulldog CeeCee were taken by my husband Mike a week or two ago while on a walk through the woods near our property. We've had CeeCee about 5 months now and she has become a very much loved member of our family. Talk about personality! But we are grateful for Cesar Millan and his Dog Whisperer book, “Cesar's Way” and his show and DVDs. If it weren't for his instruction, CeeCee would be unmanageable." "Our other dog, a yellow Lab named Shelby, adopted us nearly ten years ago (she was about 4 years old) and was just a buddy. We didn't train her to do or not do anything; she just did her thing and usually agreed with us and followed us around. I started walking for my sanity's sake and she enjoyed tagging along...no leash or rules, just companionship." "CeeCee was another story. She was a little over a year old when she was given to us by friends who had to move across the country and couldn't take her along. So before she came to our house, we started reading everything we could find on American Bulldogs. I saw the info on the dogbreedinfo site about Cesar and devoured his book. We found the show and soon after I started ordering the DVD sets so I could watch the episodes over and over. As soon as she got here, we took her for a long walk together. We have continued to walk her 2 or 3 times a day for a total of 1-1/2 to 2 hours and she has become a calm, well-behaved young lady." "She has a very dominant personality, so the adjustment was a big one for me, after our easy-going Lab. We have to consciously be the pack leader 24/7. She thinks any package left by the delivery man is her new chew toy, and still gets too excited occasionally, but she is learning to sit still and control her impulses. Our neighbors have wolf-dogs that occasionally get loose and it doesn't scare CeeCee a bit (wish I could say the same for me). She holds her own and is gradually winning them over." "Having to be the calm-assertive pack leader has been life-changing for me. CeeCee came to us during a time when I was grieving a very traumatic event. She was the catalyst for letting go of things I couldn't fix or change. At first, we were tempted to rename her Bessie. She had just had a litter of pups and the resemblance to your average Holstein was remarkable. Now, all trimmed up and dressed in her fancy black lipstick, she makes us all smile." 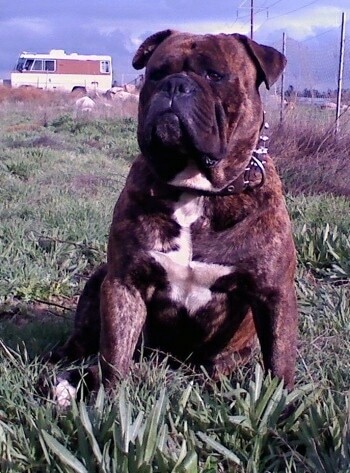 Mr. Captain Crunch "Bull Run Bulldog" American Bulldog A.B.A. 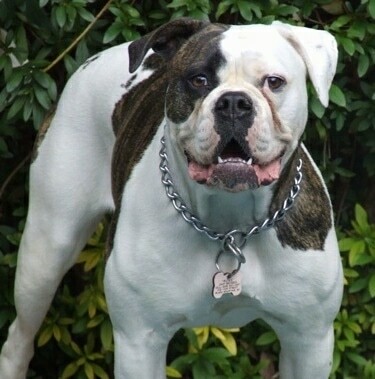 registered 4th generation, Johnson bloodlines, bred by Ralph Vargas, Jr.
"This is Casey, our 18-month-old American Bulldog. He is my first dog and has been the best dog anyone could ever have asked for. After originally being chosen by another owner, Casey spent the first 2 months on his own crated nearly 23 hours a day, by himself without a toy in his crate. Finally the owner allowed him to go to a better home with me and my fiancé. Since that time he has been the most loveable, affectionate dog anyone could ask for. He loves to play with other dogs, especially his new 3-month-old sister. He even tries to play with our 3-year-old cat. 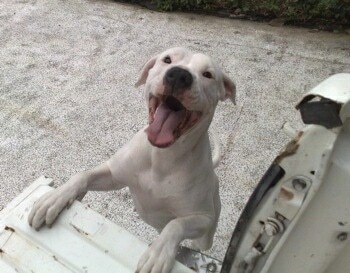 A true Johnson bully, he loves to be out doors running and training. 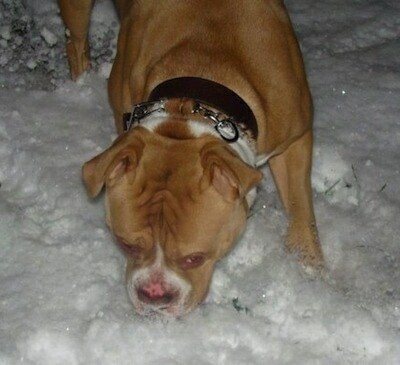 His favorite things to do are play with his football, play tug, dig holes and eat freshly fallen snow." 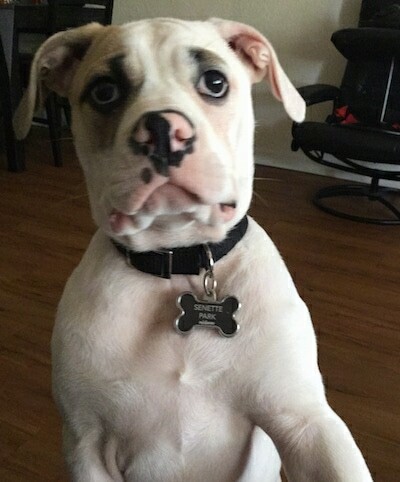 "Carson the American Bulldog; Carson comes from the bloodline of Chance from the movie Homeward Bound (they have the same father). My husband has watched the Dog Whisperer gaining a lot of tips on how to get Carson to "calm" down. She loves people and thinks that everyone must love her. After using some of the techniques on the show, she has really changed into a calmer dog." "I've owned dogs all my life and have never been as challenged or rewarded as working with this dog. Rose was a rather destructive puppy, but only when left alone. I had to crate her during periods when my wife and I would both be away to keep her from destroying our home or ingesting foreign objects. By the time she was a year old, she could easily jump the 6+ foot fence surrounding our property and would at the sight of a dog walker, car, squirrel, or even once, a butterfly! I thought we had taken on more than we could handle, but she learned commands and tricks faster than any dog I'd ever had. She would be so calm at home all day, but as soon as we'd have company, she'd run laps around the house, "attack" toys, and shove them into the thigh/crotch of our poor guests. We began educate ourselves, and the first step was to walk her 2 miles a day, play fetch and Frisbee for marathon sessions, built her a "spring pole" of sorts, and even take long bike rides with her on leash. Her excitability at newcomers decreased right away, and her furniture-chewing habit ceased. Currently at almost 4 years old, she's the best dog I could ever hope for. I shudder to think that we considered giving her up for adoption, and now people ask us how we have such a well-trained dog! " "This animal needed lots of exercise. LOTS! And Rose required being handled a bit more sternly than the Labs, Rottie, and mostly mixed breeds I'd owned previously. Only one harsh correction was usually needed; two thousand light vocal reprimands meant nothing. Today if we are playing fetch and the ball goes over the fence, she looks at me almost trembling and I can either tell her "get it" (allowing her to hop the fence, retrieve, and hop back) or give her a stay command. 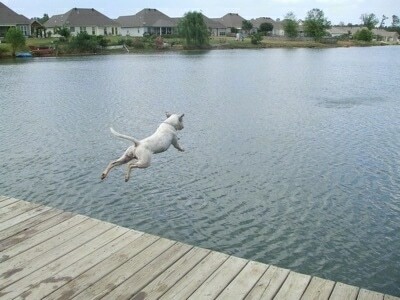 At 18 months of age, I never believed this dog could restrain herself from any impulse. 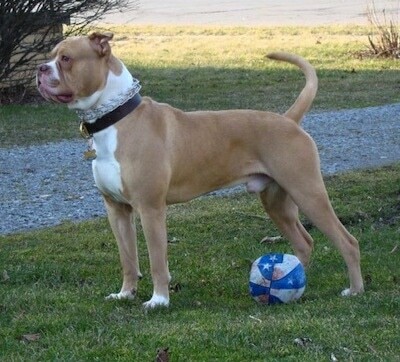 I only have one dog of this breed to draw on, but I'd venture to say that the American Bulldog needs stimulation, love, play, but most of all exercise and an occasional heavy hand early on, so we could establish her place in our pack. She has made my wife and me far more physically active than we had been, and even that is life enhancing." "This dog (and perhaps breed) would not have been good for everyone, and it was a close call that we kept her long enough for her to turn out so perfect for us. They are incredibly powerful; playing tug with her has to be experienced to be believed. At only 78 pounds, Rose can jump, pull and bite like nothing else. She once jumped up and bit a tree limb and just hung and shook after I took her rope toy down from the limb. Their enthusiasm is a big part of their charm, but I would not recommend this breed to a busy person who can't devote the time. She is great around kids, cats, other dogs, and even just barks or whimpers when she encounters a snake or turtle while we're camping. But Rose was on the fast track to being given up, when we realized she simply needed more exercise and for us to be more firm with her." 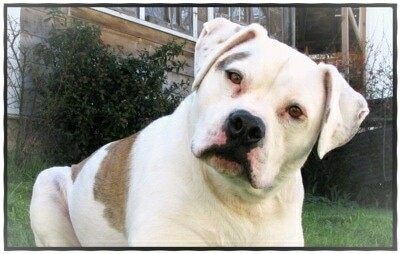 "Zeus, my male American Bulldog at 2 ½ years old—he is a really big lap dog and loves to cuddle. He requires a lot of exercise or he can get himself into trouble (he is very strong). The most important thing in raising him was being firm and consistent on everything. He is very smart and learns things quickly, even bad habits. He is somewhat protective of females and children around strangers, but if introduced loves everyone." 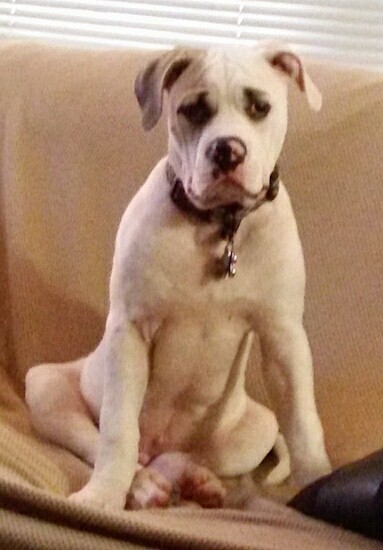 "This is Benelli, our American Bulldog, shown here at 6 months, weighing 62 pounds. Benelli is excellent with our 2 young children, ages 2 and 3. She's so calm and gentle that my 3-year-old can hold the leash while we go for walks. She absolutely loves our cats and she gets along very well with our other dog. 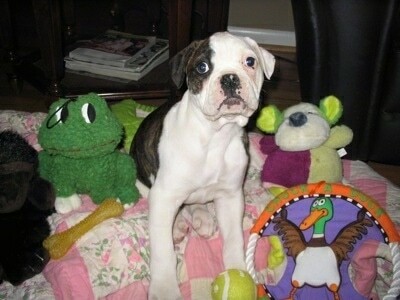 This is our first American Bulldog and we couldn't ask for a better dog!!" 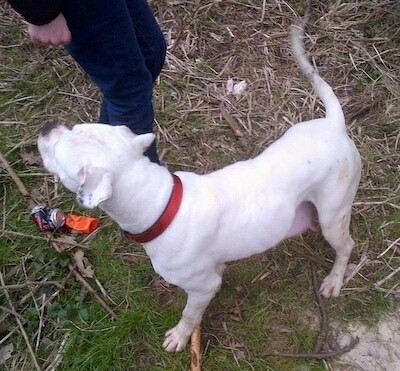 "Hello, this is my American Bulldog female at 10 months old. Her name is Wanda. I have learned so much about her from your website; it is very interesting and useful. I taught her how to sit and how to walk beside me, not in front of me by your instructions. We live in El Salvador in Central America." 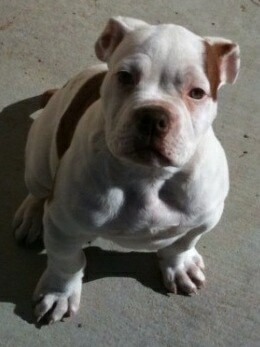 This is Porky the American Bulldog puppy at 10 weeks, weighing 21 pounds. He's my first AB and I am impressed with the breed. His father is a Johnson type doggy and his mom a Scott type. 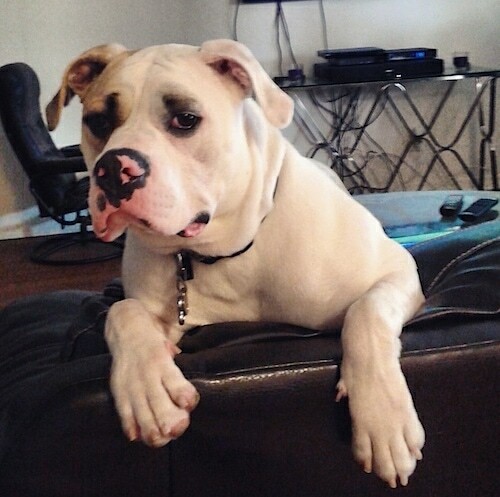 Belle the American Bulldog at 3 years old—"We rescued Bella a year ago from a pen in a neighbor's garden. She weighed 34 pounds (17 kilos) and had ten pups inside her. She was a very scared and seemed to be an aggressive dog. I broke through the fence when no one had been to her cage for 4 days. After a lot of shouting and abuse from my neighbor she eventually let me have her. She had 10 pups in my summerhouse and slowly each day she came to trust me a little more. She still growled and was scared of everyone else. We brought her into our house and had a cage for her. Cesar Millan was and is my hero. He gave me the belief in myself that I could cope with such a big scared dog. We have now had her for a year. She is like a different dog. She sleeps with the cats that she once so wanted to attack. She no longer needs the hated cage and loves visitors that used to scare her. I have never had a dog before and to be honest never really wanted one, but my Bella has filled a gap I never knew was there. 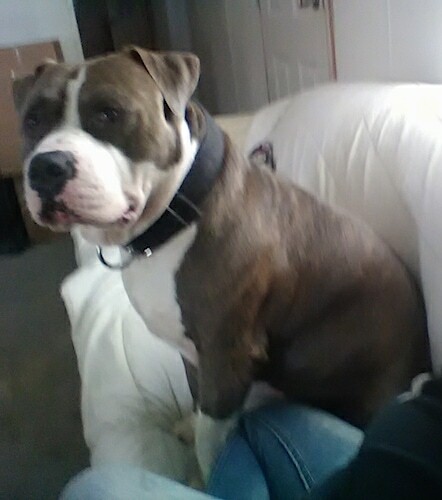 So for anyone out there thinking about owning a rescued American Bulldog all you need is lots of patience, a strong will and a touch of Cesar Millan."